Misting plays a key role in keeping a happy healthy chameleon(s). Misting helps to maintain humidity, flushes out eye irritants, provides a water source, and benefits your live plants. There are many different ways of misting. Some of us use a hand mister/spray bottle, some use a pressurized plant sprayer, and some use an automatic misting system. Most who have only one or two cages to mist will use a hand spray bottle. Try that with more then a few cages three plus times per day everyday and your hands will be in pain. 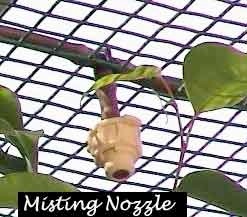 Automatic misting is a very useful and effective way of misting multiple cages all at the same time, every day hands free. This relieves the stress of you having to do it manually and remembering when to do it. There are a few brands of packaged automatic misting systems and there are home made DIY (Do It Yourself) systems. An automatic misting system may not be for everyone. If you only have one or two chameleons to care for you may not see a need for investing in one. When you have multiple cages, an automatic misting system is an invaluable part of your setup. An automatic misting system also works great in case you have to leave town for a few days or go on vacation. Chameleons can go with out food for days, but daily hydration is critical for health. This way your sitter only needs to feed your chameleons not mist them 3+ times per day. This is where the automatic part of the system comes in to play. The system will turn on and off with or without you being home. I am going to go in to detail on how I have my indoor and outdoor systems put together. The indoor system I use is a pre-made kit, the Rainmaker Jr. ™ with added nozzles and tubing to what comes with the kit for all my cages. These kits are very easy to set up, and are worth every penny in my opinion. I have my system hooked up to be fully automated, so that misting is automatic and refilling the reservoir is automatic, 100% hands free. I use a RO/DI water filter system to refill the reservoir. This is connected to a solenoid valve that is controlled by a float switch. 3. Extra Tubing (the kit comes with 10 feet) you can also buy extra tubing from home improvement stores. 6. Adapter to water source for water line to water filter (Depending on the source you tap you will be using PVC/copper fittings or just copper fittings.) I used PVC/copper fittings, source is a ¾" PVC pipe that used the following fittings 1- ¾" T, 1- ¾" slip ball valve, 1- ¾"slip X ½" MPT adapter, 1- ½"FTP X ¼" water line copper adapter. Make sure all connections are tight. Turn back on your main water source, and plug the float switch in to your power source. Allow the reservoir to full up; the water will automatically shut off when the reservoir is full. Then plug in the pump to the timer that you programmed to turn on and off automatically at the set times, and then the timer to the power source. Now you're all setup with a fully automatic misting system. You do not need to use a RO or RO/DI water filter. I happened to have one already so I used it. I also have very hard water and the filtered water keeps the small nozzles from clogging. See a past EZine article on Water for more information. 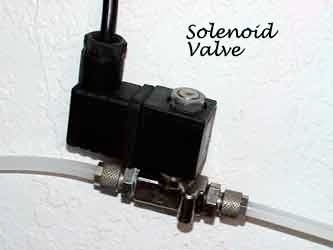 You can find the float switch and solenoid valve at www.customaquatic.com . 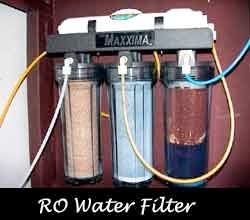 You can also find RO or RO/DI water filters at www.customaquatic.com , home improvement shops, and www.championlighting.com . I use the Rainmaker™ system because it is well put together. Some of the features I like are the larger 5 gal reservoir, metal clamps (not zip ties), plumbed with outtake for the pump with a bulkhead on the bottom side of the reservoir, stronger pump, stronger threaded tubing, and better nozzle assemblies. The extra money these systems cost compared to there competitor is well worth it in my opinion. You can buy the Rainmaker™ systems direct from the manufacture over the net at http://www.cloudtops.com/misting_systems.htm . 1. Double the amount of Teflon tape on all misting assemblies to prevent leaks. 2. If you get a leak in the misting nozzle use a bead of aquarium silicone to make a seal. If at any time you need to replace/clean the screen in the nozzle the silicone will come right off. 3. Try to keep the water line connected to each misting nozzle at the same height to prevent back siphon. 4. Wrap the pump with a towel to quite any excess noise from vibrations when the pump is on. 5. If you choose to use a RO or RO/DI water system cut a small hole in the lid of the reservoir for the filtered water line and keep the lid sealed. This will keep out dirt, dust, insects, and so on. Check the reservoir now and then to make sure it stays clean. 6. Keep the reservoir in a dark area; this will prevent growth of algae and bacteria. You can add a small 50w submersible heater to the reservoir for a warm mist. The outdoor system consists of parts that can be bought at your local home improvement store. All items can be easily found in the plumbing/irrigation section of the store. 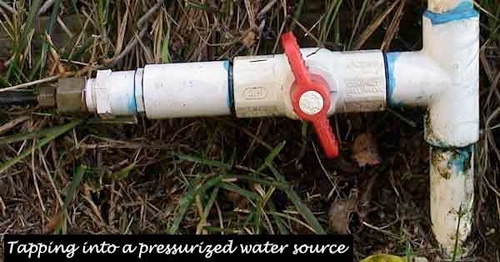 This system relies on the water pressure in your water line. There is no pump with this system; it is controlled by a digital water timer (electronic control valve). This system can mist up to 4 times per day and from 1-60+ minutes per misting duration. The only requirement to use this system is that you have access to a water faucet. Connect one end of the tubing to the faucet adapter. Connect the faucet adapter to the faucet. Then run the tubing to the first cage. Cut the tubing after you have it in place for the first cage. Attach a "T" fitting to the cut tubing and connect the extra tubing to the other end of the "T" fitting. Run the tubing to the next cage and do the same. Once you have run all the tubing and connected all the "T" fittings, you will need to attach the "L" fitting to the last cage. Cut a 1" piece of tubing for each fitting to attach the misting nozzle to. The misting nozzle should be the last piece you add. So attach the 1" pieces to the fittings above each cage first. Attach the misting nozzles to each cage, the nozzles I use are threaded and should be screwed into the tubing not pushed like you would have done with all the other fittings. Program the water timer to your needs, you can add some Teflon tape to the fitting on the timer, this is optional. Then disconnect the adapter from the faucet, and attach the automatic water timer to the facet. Then reattach the adapter to the timer. The reason I do it this way is because the faucet is a lot stronger then the timer and it will prevent you from accidentally breaking the timer when running the tubing to the cages. Make sure all the fitting are tight and in place. Turn on the water faucet and leave it on. The timer will act as the control valve and turn the water on and off at the pre set times you programmed into it. This system will produce a fine mist. The misting nozzles are rated at 0.5GPH (gallons per hour). If you have a hard time locating any of the parts just email me. You should be able to run 20+ nozzles with this system. If you need to run more then that all you need to do is up grade the size of the water line. The screen I use on my outdoor cages is a ½" PVC coated hardware cloth so there are no issues with attacking the nozzles to the cages. If you use a smaller screen just cut a small hole in the screen and slip the tubing through, the fit should be tight. 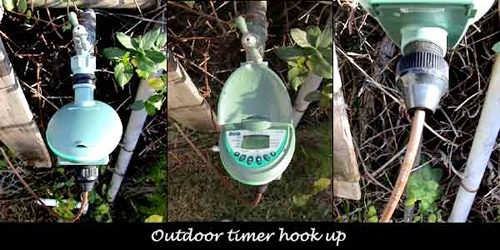 You can also use this system indoors you will just need a place to attach the water timer to. 2. If you need to control the misting nozzles you can buy ¼" control valves. These two systems have worked great for me. The misting durations will differ from user to user. Play around with the system till you find what works best for you. With misting comes excess water, so you may consider adding a collection tub to your setup if you find you get a lot of excess water. This can be as simple as a plastic pre made tub to a custom built acrylic tub. You can find a large selection of tubs at superstores; you should be able to find something that will work for your setup.